My second chili day in a row….this time with some meat! With the weather at a minus 20 degree wind chill factor, it doesn’t hurt to turn up the heat with a little more of this warm comfort food. The nice thing about this recipe is that it doesn’t skimp on being good for you. I will have to admit that I took the recipe right off of the back of the Great Northern bean bag, but if it works, it works! Just throw it all in a slow cooker--what could be easier? In medium bowl, combine chicken, garlic, cumin, salt, chili powder and cayenne pepper; toss to coat chicken. Add seasoned chicken, beans, chicken broth, onions and chiles to a slow cooker. Cook on HIGH for 4-6 hours or LOW for 8-10 hours. Serve with cilantro, sour cream and shredded cheese, if desired. Easy comfort food, but next time I may have to double the recipe....I had no leftovers for lunch! I hope it warms up for you! This tasty-looking chili should definitely help with that! I've been thinking about making a white chili and this looks delicious. I would have purposely left out the cilantro so no biggie there! It looks like the perfect thing to eat on a freezing cold day! how good is that!! fantastic and healthy! I wanna make this right away! Oh yum! LOVE white chicken chili. This sounds so tasty. It's pretty cold here, but not that bad! Course, I still want some chili. Heh. This sounds so yummy! Tis the season for great chilis and soups! I have never made, nor had a white chili. It looks mouthwateringly good though. I need to try this. 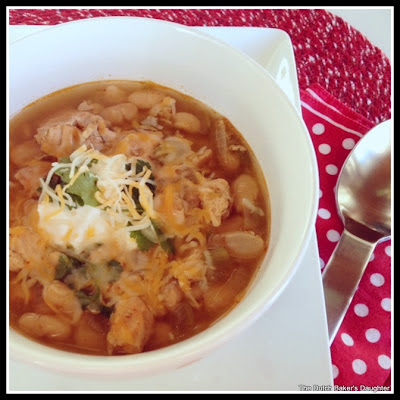 Your chicken chili looks wonderful! So hearty and warming. A delicious comfort meal. This looks really good. Going to try it tomorrow! Thanks!